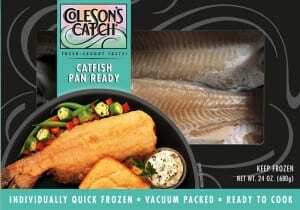 Catfish Pan Ready | Coleson Foods, Inc. The pride of the South, Catfish’s most recognized unique quality is its consistently mildly nutty and lightly sweet flavor. The deliciously fresh versatility of farm- raised Catfish suggests the endless preparation possibilities. Its lightly firm, moist, flaky texture adapts well to most recipes, while its low-sodium and calorie content are an additional reward. Fresh farm-raised Catfish is undoubtedly not just a Southern taste sensation anymore, but has become an addition to all fish lovers’ plates.